I wanted to share with my cousin how, by making a small change in his annual return, he can make a HUGE impact in his portfolio. 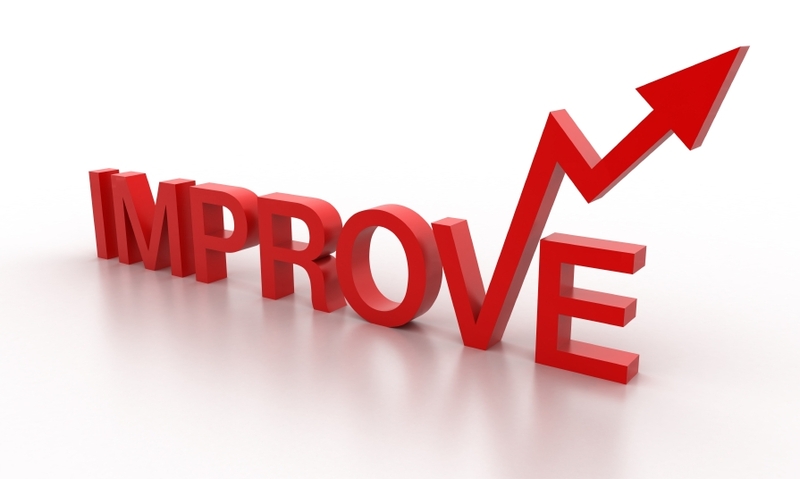 If you’re reading this blog, you already know how to get higher annual returns (diversify OUT of the stock market – sound familiar?) So let’s look at what will happen. We remember the worst case scenarios well: The last 5 years. For our example, we’re going to look at some ‘best case’ scenarios. And these returns can actually be more conservative than the stock market! 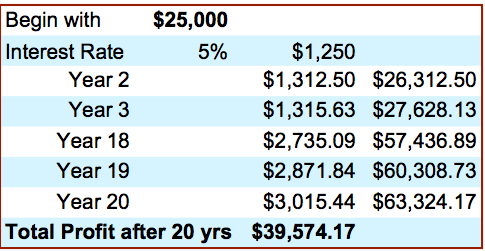 OK – So with this, you’ve averaged just slightly under $2,000 per year. Is this true??? Yes, it’s really true. 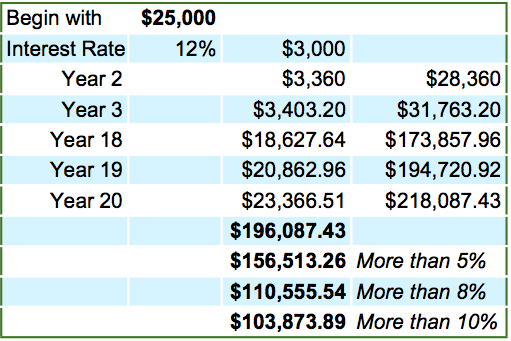 You’re making nearly $100k more when you double your interest rate. THIS is BIG! 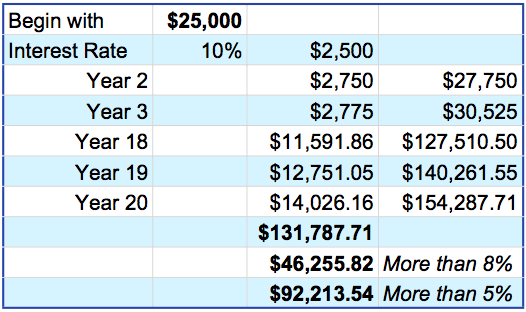 So with 12% compound interest, we see that there could be significant gains. And this is all very exciting stuff, to be sure. But we need to keep in mind that this is purely as an example of the potential of a 5%, 8%, 10% & 12% returns. 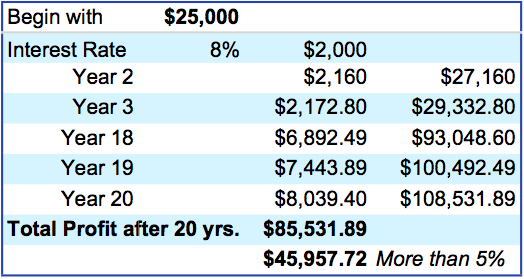 Nothing in our lives is guaranteed, and this holds true for these types of returns. It seems as though we’ve seen many worst case scenarios lately, right? No need to go into that. But please go back to my earlier post, Information: The REAL Challenge of the Stock Market to see some facts about the performance over the last 10 and 20 years. If we can see the market’s past performance, and truly see it for what it has been historically, and add to that another way to gain even a few more percentage points on our annualized return, we’re on our way out of the 5% doldrums, and up to the 8% wake-up call. If we’re really awake to other possibilities, we can see 9% or 10% returns with a huge amount of safety. YOU MUST SEARCH THESE OUT! I’m not here to bash. I’m not here to tell someone their biz is bad, or that they’re not performing a valid service. I AM here telling you that finding a more conservative way to maximize your return through diversification, and increasing your participation in YOUR portfolio is critical: nobody can make you rich except for you. Get to it! Working with a planner? Getting a good return? Awesome! Answer this: What kind of impact would an extra 2 or 3 percent help your long-term goals? What can you do RIGHT NOW that will get you there?